Cloe Cassandro's line of ethically-made beachwear is a celebration of Balinese culture, and each piece is handcrafted and dyed by local artisans. 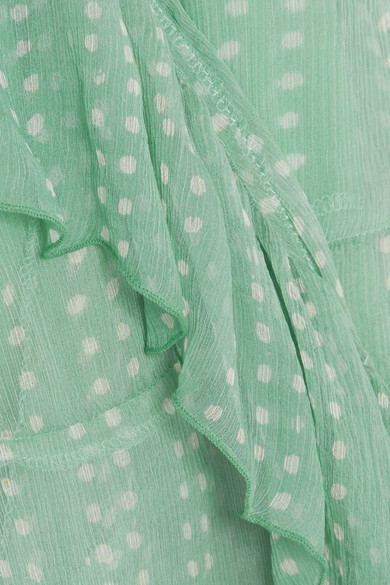 We can easily imagine wearing this wispy polka-dot silk-crepon 'Kimi' mini dress on one of the island's beautiful beaches. It's cut in a flattering wrap silhouette framed with pretty ruffles. Outfit 1: Hunting Season Tote, ATP Atelier Sandals, Isabel Marant Necklace, Monica Vinader Bracelet, Chan Luu Bracelet, Dinosaur Designs Earrings. Outfit 2: Marysia Bikini top, Marysia Bikini briefs, Melissa Odabash Fedora.